By Sean Barron | August 10, 2018 at 12:05a.m. Even though she’s about to enter kindergarten, Addie Hudock is able to see her way more clearly when it comes to fire safety. “You should open your window and stick out your head so you can get fresh air,” the 5-year-old observed after her experiences in a fire-safety classroom vehicle, part of which was converted to a makeshift smoke-filled house. Addie was among the estimated 130 incoming kindergarten students representing West Boulevard, Robinwood Lane, Market Street and Stadium Drive elementary schools who took part in Thursday morning’s Safety Village at Glenwood Junior High School. 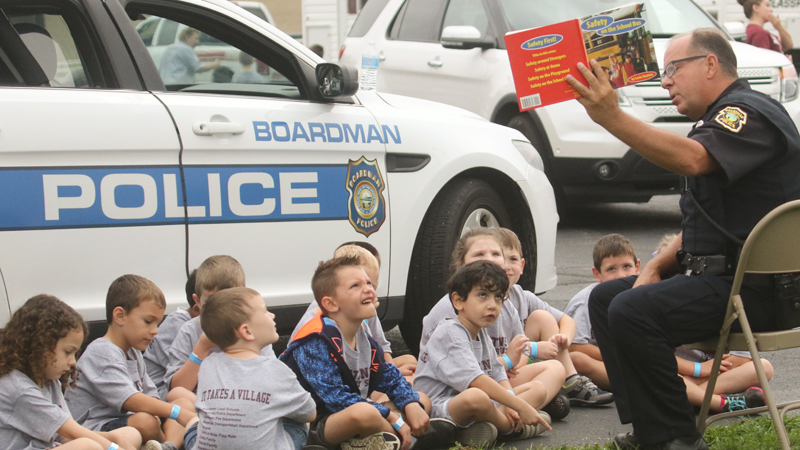 The hands-on program’s chief aim was to instill in the youngsters the importance of a variety of safety lessons before the start of the school year. Hosting the event were the Boardman PTA Council, along with the school district and the township. Other core areas covered included bus safety, as well as the importance of using seat belts in cars, wearing helmets on bicycles and properly using crosswalks, noted Lia Rudiak, event coordinator. During a series of demonstrations, part of the fire-safety vehicle was filled with a foggy mist that simulated smoke, and the children were shown how to escape by calmly climbing out a window. In the event of a house fire, it’s critical to stay low, feel a door for heat and escape to a designated meeting area, fire Chief Mark Pitzer stressed. It’s also important for youngsters to sleep with their bedroom doors closed to prevent the spread of flames and smoke, he noted. “That’s the No. 1 killer of anyone in a house, breathing in smoke,” PItzer said, adding the township fire department’s average response time is 4 Ω minutes. The children also received a battery of safety lessons pertaining to school buses, including properly entering and exiting, as well as learning about “danger zones,” which are areas 10 feet from all sides of the vehicle, many of which are considered blind spots. “It’s all about keeping these guys safe,” said Laurie Woolley, an on-board instructor who showed the youngsters how to safely approach a bus before boarding. That rule is especially valuable for kindergarten students, given their heights, which often makes it difficult for them to be seen if they’re too close to the front, sides or rear of the bus, she noted. Among those taking in the lessons was Zoltan Wetzl, 5, who will attend West Boulevard Elementary. “I’m excited to ride the bus,” said Zoltan, who came with his mother, Ana Wetzl. Tom Harris, a nine-year driver with the district, provided a series of safety demonstrations on the vehicle. “We’re trying to let them understand that the school bus is an extension of school,” Salser explained, adding he also wants children to see that police officers are approachable. August 9, 2018 12:52 p.m.
October 21, 2008 12:04 a.m.